FlexHub now runs on a Synology NAS! 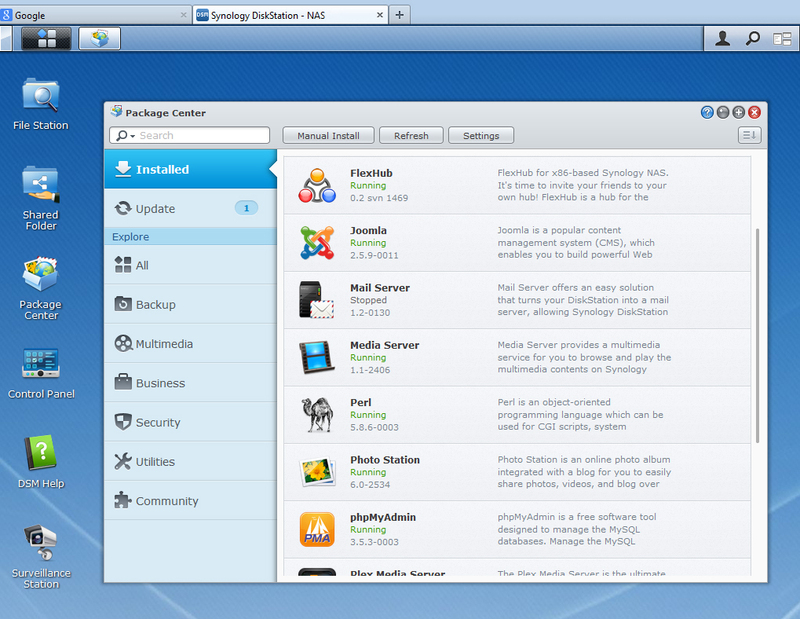 This package has been installed manually, but if there is enough interest we can create a standard Synology DSM package. So if you're the owner of a Synology NAS with an Intel x86 processor and you'd like to run the coolest Direct Connect hub on it, drop a message below! Is with Flexhub possible to connect with any hub ?? Mac Os x is not supported ?? And more generally, without using Flexhub or Synology nas, in dc++ is possibile select a network folder as a shared folder ?? FlexHub is a hub, it only connects to clients, not other hubs. I dont have access to any Mac Os X so I can not tell if it works or not, sorry. You should be able to select a network folder in DC++ for sharing, but it is possible you have to map it to a drive letter for it to work properly. Work adcs on the NAS version ? I pretty much created an account just to voice the support. I would absolutely love to be able to set up a Hub on my Synology NAS. How can I install it on my RS2212RP+ NAS? Would love to see a package made for the Synology NAS. At this moment it is the only reason I need to keep my energy slurping main computer running. Everything else has been moved to the NAS (Torrents/NZB/Sickbeard/Website). Would you be willing to share the code for the Synology Package...or you not ready to release yet? Thanks already for having the knowledge to program something like this...and for having the idea to make it for the NAS. Thanks to exleper, the package for Synology x86 NAS is finally under active development again. A release can be expected soon(ish). Fantastic, I am keen to see what this does.